Stimulants7Nutrition Dendrox Vol.1 - 80 kaps. Sport Definition Caffeine [That's for Her] - 120 tabl. Olimp Caffeine Kick - 60 kaps. High quality caffeine in capsules (as much as 300mg per serving), thanks to which even the weakest day will be full of energy! It provides a rapid energy injection, improves concentration and concentration, and even has a positive effect on metabolism. It allows you to dismiss the feeling of fatigue and improve your well-being. 7Nutrition Dendrox Vol.1 - 80 kaps. If you are looking for a product that will provide you with a greater boost of energy than ordinary caffeine tablets - reach for the dendrobium! Fully legal supplement the action, which can not be compared to other stimulants. Feel the power !!! Since the withdrawal supplements based geraminę (or 1,3d) was proposed to supplement market with similar potency. This situation changed dramatically when placed on the sale of products 7Nutrition Dendrox Vol.1! Thanks suplementowi feel what it means to "unbridled power" - so massive injection of energy you did not have a chance to feel so far. The challenge? You must know that this is not a supplement for children! The powerful energy, focus and stimulate training which not felt since the strongest measures based on DMAA. Experience the power of action, which gives the most sought-after component of recent months - Dendrobium. We have designed a product that combines the benefits of dendrobium, together with excipients, which will be applied periodically, in times that are most optimal for your body. As the only company we will give you a complete system pre-workout, which previously was not. Dendrox you appreciate practicing bodybuilding and martial arts. No compromise. Dendrox Pre-Workout System. Find out for yourself what is ENERGY FOR LIFE! Dendrox Vol.1 80 caps. For use in the morning. 1 capsule per serving. It contains 200 mg of extract of Dendrobium Nobile. Power alkaloids dendrobium - Dendroxyny, Dendrobiny, Dendraminy, Dendryny, 3-Hydroxy-2-Oxodendrobiny, included in the Dendrobium Nobile, it is used in Chinese medicine for over 1,000 years. Only in recent years it has developed a number of research and Dendrobium used in bodybuilding. See the description of the measure, which becomes a hit in the world of supplementation replacing the popular DMAA and Geranium. Dendrobium nobile, a species of plant belonging to the orchid family. There is a mountain area up to 1800 m. N.p.m, mainly in China and Thailand. Fruit dendrobium is known in Chinese medicine as a medicinal and under the name Shihu. Dendrobium contains the above-mentioned alkaloids, which have a direct impact on the body intensively trainee athlete. 7Nutrition Dendrox Vol.1 is extracted from Dendrobium Nobile 10: 1 at a concentration of 200 mg 1 caps. - Stimulation of the central nervous system. Naturally occurring Phenylethylamine strengthens the feeling of concentration and modulates the well-being and willingness to hard training. Some had greater confidence when applying Dendrobium for a minimum period of 14 days. - Long-term, minimum 12-hour stimulation of energy and metabolism. Dendrobium, unlike caffeine does not raise blood pressure and does not restrict blood flow. Energy generated by the dendrobium is maintained at a constant elevated level and provides a gateway to stronger stimulants found in energy pre-workout supplements. Without dendrobium, some strong stimulants of energy can cause too big effect, popularly called the "exit" after training, and the cause is too much load on the blood vessels and insufficient oxygenation after a very intensive training units. 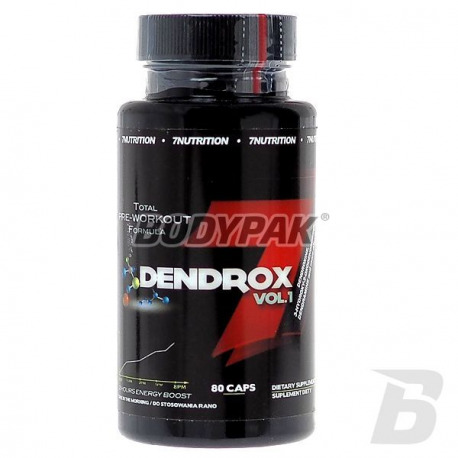 Dendrox Vol.1 help neutralize the negative effects of the most powerful pre-Workoutów. - Enhance the capacity of the body's oxygen. In traditional Chinese medicine Dendrobium nobile was often used therapeutically with any kind of lung disease. Dendrobium expands bronchial tree streamlining increasing oxygenation of the body. In a direct way it can increase your aerobic fitness, training opportunities and performance. HOW TO FEEL THIS ENERGY - NOT reach for NOTHING ELSE !! Do not connect the Dendrobium in one portion of Beta Alanine! Dendrobium be used alone, a minimum of 1 hour while maintaining a break from the other components Przedtreningówek popular. Beta-alanine are combined in the brain of both glycine receptors or GABA (gamma-butyric acid). By this, it could block the capture process and reduce the activity of GABA glutamatergic system. Glutamate is the most important transmitter in the brain to stimulate activating the NMDA (N-methyl-D-aspartate). Since this is a large amount of glutamate, dispersion of beta-alanine in the brain stimulates the activity of NMDA receptors by increasing synaptic activity. Alkaloids dendrobium also are agonists of glycine, so they will work on a similar path, and thus "compete" with beta-alanine. The effect, however, can reduce the "amplitude" muscle contractions. After consumption of Dendrobium in one portion of the beta-alanine there may be some numbness and muscle spasms, reduced susceptibility synaptic stimuli, in radical been observed with over-stimulation of the optic nerves and transient headache. Dendrobium reduces the depolarization of the nerve terminals initial induced by beta-alanine and taurine. When designing this supplement taken into account all aspects - so using this product you can be sure that it works! In 7Nutrition we approached the subject from the ground looking for the ideal solution. Producing Dendrobium capsules in a separate package we panacea for this problem. We recommend a minimum of 1-hour break between the portion Dendrox Vol.1 in a capsule, a portion of the complex pre-workout Dendrox Vol.2. 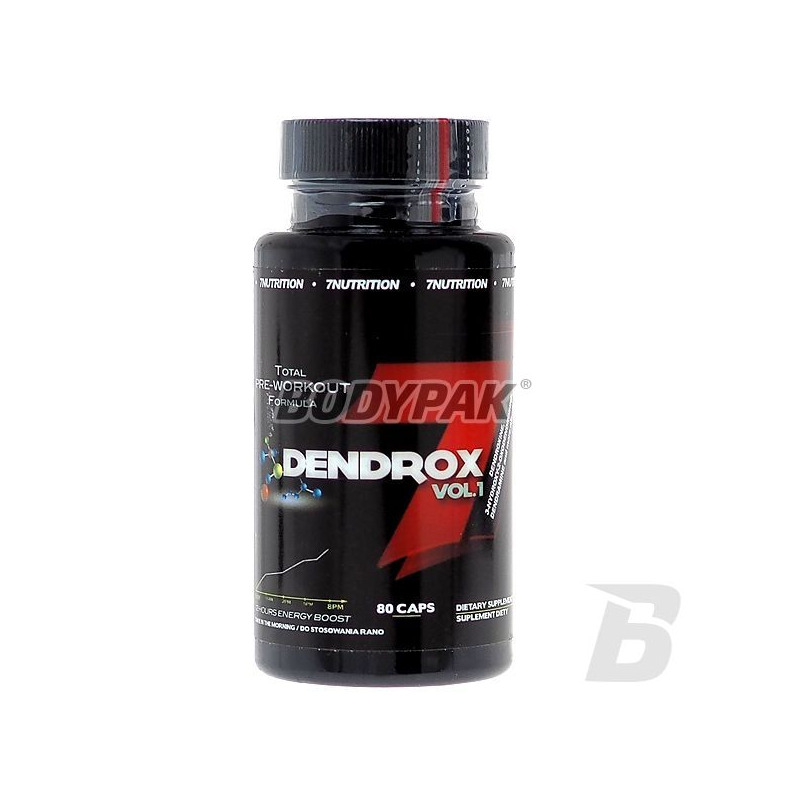 7Nutrition Dendrox was developed specifically to enjoy the maximum effect of the extract dendrobium taking it in the morning on an empty stomach, and adding to this set of components typically contained in pre-workout powder Dendrox VOL.2. This allows you to have a complete training system created in order to make the most of the alkaloid dendrobium. Faktycznie lepsze pobudzenie jak po kofeinie, a już w połączeniu z nią to wywala z butów!